Mani brand 10-0, green mono, polyester sutures with double arms. Trape spatula needles ranging in length, curve, and diameter. Mani sutures are ideal for micro-suturing on the cornea and sclera during eye surgery. 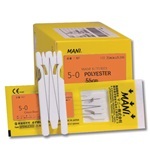 Mani brand 5-0, green or white braided, polyester sutures with double arms. Trape spatula, dia spatula, and taper point needles ranging in length, curve, and diameter. Mani sutures are ideal for micro-suturing on the cornea and sclera during eye surgery. Mani brand 4-0, green or white braided, polyester sutures with double arms. Trape spatula and dia spatula needles ranging in length, curve, and diameter. Mani sutures are ideal for micro-suturing on the cornea and sclera during eye surgery.